Watch out for the puns! 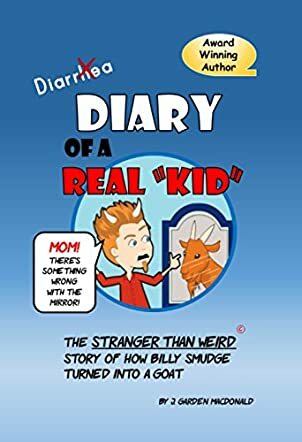 In the tradition of the “Diary of” books comes this one-of-a-kind Diary of a Real Kid: The Stranger Than Weird Story of How Billy Smudge Turned into a Goat by J. Garden Macdonald. When Billy Smudge and his best friend, Shamus McNutt, break into the school (to retrieve Billy’s stinky gym clothes so Mr. Atlas won’t say Billy smells like a farm animal), Billy topples into the science lab and accidentally swallows some purple goo. That night Billy dreams he’s a goat and the next day he has goat hairs on his chin. And he starts eating really weird stuff. Billy and Shamus try to get help from their science teacher, Dr. Prankenstein, but he's just too weird. Billy starts fainting (apparently he’s turning into a fainting goat) and everything just goes from bad to worse. Before it’s all over, Billy is surprised to learn about who certain people really are and who he himself is becoming. Diary of a Real Kid is a quick, light read that should appeal to preteens, especially boys. Cartoon drawings are scattered throughout and they further the story as some of them show what Billy is thinking. True to the cartoonish feel, most of the characters are one-dimensional, but it all works. You have the boys, who spend their weekly allowance on "Stranger Than Weird" magazine, a giggling girl gang, a bossy older sister and her pizza-delivering boyfriend, and a mad scientist with a talking cat. Diary of a Real Kid doesn’t take itself too seriously and yet Macdonald sneaks in a really positive message to kids (real kids, not goat kids) about who they can become. Diary of a Real Kid should find a place on the bookshelves of 4th-6th grade classrooms everywhere.